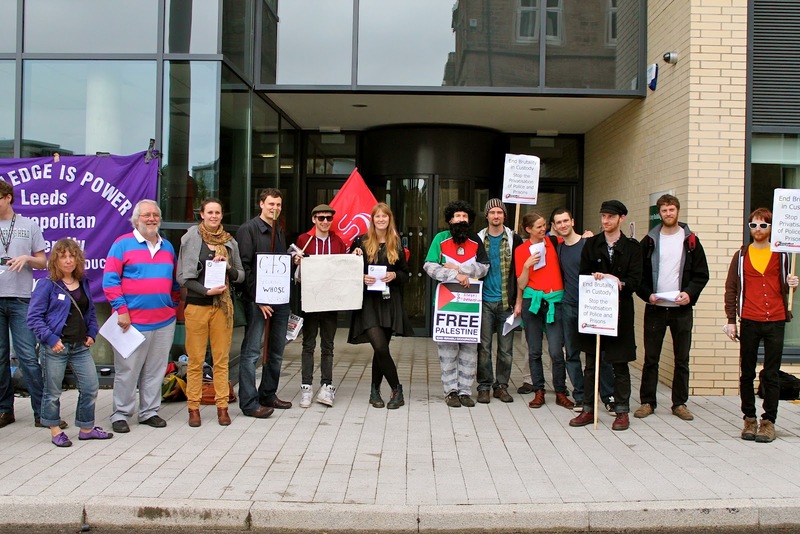 Early this morning, Yorkshire NotoG4S campaigners assembled outside Leeds University's Liberty building just to make sure that the attendees of the Centre for Criminal Justice Studies' conference on Private Sector Involvement in Criminal Justice were getting both sides of the story. Representatives from SERCO's 'Secure Accommodation and Security Services' and G4S' 'Justice Services' were due to speak at the conference, alongside academics and researchers from across the country. Campaigners from Leeds Palestinian Solidarity Campaign, UCU, Unison and the Socialist Workers Party joined asylum-rights activists outside the conference venue, distributing leaflets that detailed G4S and SERCO's unsavoury history. Many conference attendees even expressed explicit support for our campaign against the continual outsourcing of the state. A member of G4S staff even stopped for a brief chat. In conversation with one of our campaigners, this member of G4S staff stated that the company had completely pulled out of all operations in the West Bank and, after being pressed by the campaigner on their wider involvement in assisting the Israeli army and police, stated that they were currently reviewing their contracts with Israeli prisons and detention centres. We are awaiting confirmation of these statements. Campaigners also questioned a passing policeman about his views on the prospective privatisation of the police force. They believed that an attempt to contract out policing services to private companies within a massive force - such as the West Yorkshire Police - would end in complete disaster. Whilst we did not plan to enter the conference - through choice or the ridiculously high (£70) ticket price - two NotoG4S supporters, who happened to be University of Leeds Law students, were supposedly able to attend. As Law students, they were technically allowed to attend the event for free. Yet, as they took their seats in the conference hall, two members of University security staff informed them that they were no longer welcome in the conference as they had been seen participating in the picket outside. They were then swiftly escorted out of the building. We were unable to find out who authorised the removal of these two Law students from the conference, but they intend to contact the Law School in order to complain about their treatment and challenge the decision. Silencing those who disagree with the modus operandi is hardly the sign of a fair and comprehensive debate about the encroaching powers of these multi-national security companies. We will continue to raise awareness about the growing powers of G4S and SERCO over our public services, and campaign to keep private contractors out. The state is not for sale. REMINDER: Tomorrow, Wednesday 27th June, is the day that representatives of G4S and Serco are billed to speak at a University of Leeds' Law School conference about the role of private companies and contractors in criminal justice services. We will assemble outside the Liberty Building - near the Business School (see map) - at 8.30am tomorrow morning. 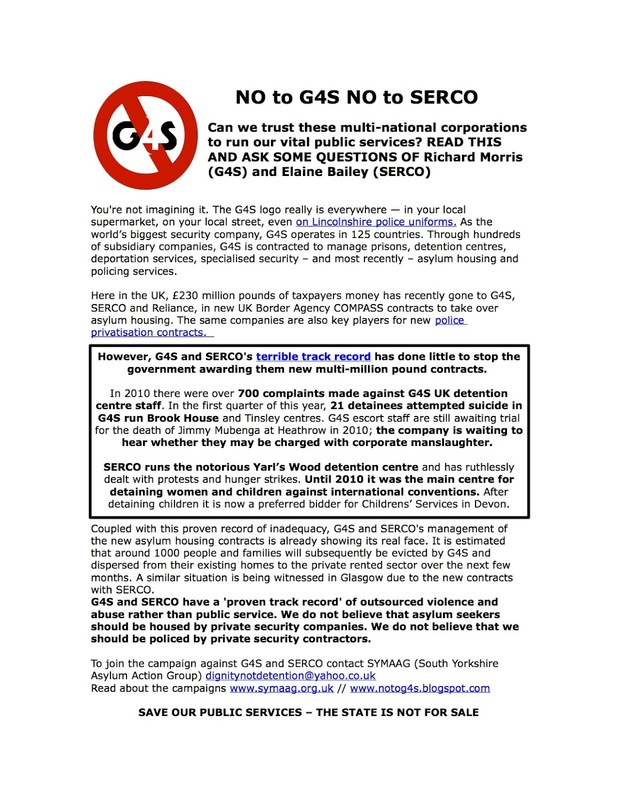 We've printed off some copies of the above flyer, but other leaflets about G4S related campaigns would be much appreciated. Get in touch at notog4s(at)gmail.com if you have any enquiries - we hope to see you there! As always, UPM refused to comment on the issue, redirecting all enquiries to UKBA. 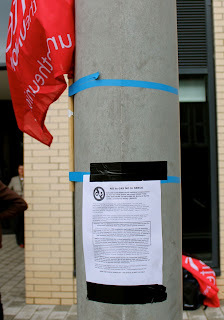 It is understood that UPM have been banned from speaking to the press by the Home Office. Further coverage of the 'severed relationship' can be found at 24-dash. United Property Management (UPM) will no longer be sub-contracted by G4S to provide asylum housing in Yorkshire and Humberside. On June 18th the phrase “G4S has selected United Property Management (UPM) as its primary housing partner” disappeared from the G4S COMPASS website. Simultaneously, UPM’s website stopped referring to G4S as “partners”. UPM has provided sub-standard housing to asylum seekers in our region for years, while UKBA sub-contracted to them, despite frequent complaints from asylum seeking tenants and asylum rights campaigners. Their recent evictions of tenants in Bradford were the focus of a campaign led by Why Refugee Women and SYMAAG. In one case, a woman and her 3 month old baby were moved 40 miles, from Bradford to Doncaster, to a bare flat with no cooker, chairs and only a tiny sink next to the toilet for all their washing needs. In what could be a remarkable coincidence UKBA announced on the same day (in a letter entitled Corporate Partners – Transition Announcement Letter (2) that “the Transition phase of the COMPASS project has now begun in the North East Yorkshire and the Humber region”. That is, UKBA no longer have to sub-contract to a company who are regarded as unacceptable, even by the standards of G4S! The next few weeks will see G4S in a frantic search for other sub-contractors paid for by £135 million of public money in Yorkshire and Humberside. We will be subjecting them to the same scrutiny as we put UPM under. No doubt there are also issues of legality relating to the COMPASS contract which was signed with UPM as the named primary sub-contractor (not their replacement organisations). 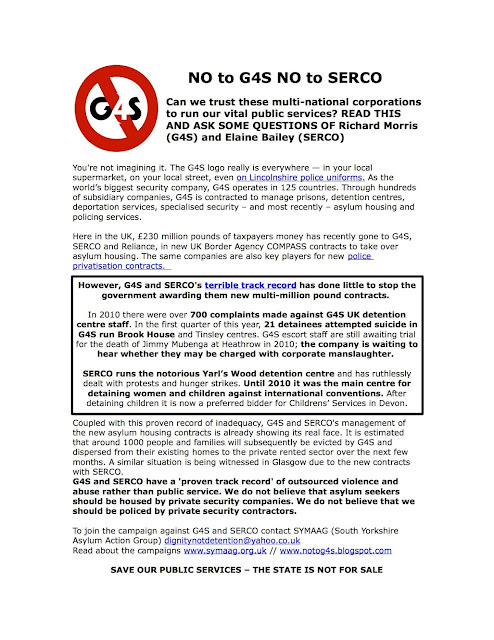 Whichever sub-contractors G4S select we maintain our view that G4S are prison guards not landlords. Their record is one of abuse towards asylum seekers in this country and elsewhere. We should not be paying them public money to operate this contract. G4S renews commitment to White House “joining forces” campaign Times Union, June 12th 2012: G4S plans to hire 6,000 returning military veterans and their family members by the end of 2013. So far, G4S has hired 3,000 veterans across the US since the 2011 start of the "joining forces" campaign. G4S to cut staff delivering Lincolnshire Police services, BBC, June 14th 2012: Staff who transferred from Lincolnshire Police to security firm G4S in a cost-saving deal have been put at risk of redundancy. G4S said that of the 580 civilian staff which transferred, approximately 60 posts are at risk. UK government to answer for hiring human rights abuser (Disclaimer: this is a Russian propaganda website), Russia Today, June 10th 2012: The British government is up for questioning from Parliament over why it has handed over the Olympic Games' security to a company accused of human rights abuses in the Israeli-occupied Palestinian territories. Half of all tagged offenders break curfew rules, The Guardian, June 14th 2012: More than 50% of offenders ordered to wear electronic tags, many of which are provided by G4S, break the rules of their court-imposed curfews, a review of the use of tagging has found. UK’s latest super-prison completed, Building Design, June 12th 2012: The £150 million complex in South Staffordshire, run by G4S, contains 17 buildings including a healthcare unit, a first night unit, a visits building, sports centre, training centre and a kitchen. Jeremy Corbyn has introduced a new Early Day Motion (Number 182) asking the Government to review its procurement procedures to stop G4S from being awarded new contracts. Ask your local MP to support Jeremy's motion! That this House notes the controversy surrounding the private security company G4S which is providing security for the London 2012 Olympic Games; further notes the concerns of a broad based campaign of non-governmental organisations, MEPs, MPs and activists who speak out against it; further notes the recent loss of contracts including one to deport people from the UK in 2011 and another to secure the buildings of the European Parliament and G4S's involvement in providing equipment to Israeli prisons in which Palestinian prisoners (both adult and children) are illegally transferred, detained and mistreated; and calls on the Government to review its procurement procedures to ensure that no government contracts are ever awarded to companies with a questionable human rights track record. Here's some great footage - thanks to Palestine Place - of last week's demonstration at G4S' Annual General Meeting. If you're in London, or nearby, over the next week, try to make it down to Palestine Place for some excellent talks, workshops and discussions. For a full schedule of events and further information, have a look at their website here. Today, over 70 people demonstrated outside of G4S Annual General Meeting, protesting against the company's disastrous human rights record across the globe. As G4S' becomes further involved with new UK government contracts, the extent of their national and global reach is beginning to be revealed. The protest today saw campaigners deliver their Alternative Report to shareholders entering the meeting, a document that masqueraded as a real G4S report but actually critiqued the actions of the multi-national corporation. G4S' various contracts extend from providing security services to the Israeli government in occupied Palestinian territories to managing asylum seekers' social housing in Yorkshire and Humberside. Despite the tragic incident of Jimmy Mubenga, an Angolan asylum seeker who died as a result of excessive force used by a G4S guard on a forcible deportation flight, the UK government has continued to award the company new contracts in the recent surge of privatisation in public services. Not only are G4S providing security for the Olympics this summer, they are now contracted to run critical parts of the Lincolnshire Police Force. See this Demotix news article for further coverage of today's protest. G4S refutes claims that the company are set to operate in Libya without formal approval, Libya Herald, May 28th 2012: In post-revolutionary Libya, G4S are supposedly planning to start operating their private security services on Libyan soil without government authorisation. G4S states that this claim is unfounded. Full list of bidders for police contracts in the West Midlands and Surrey published, Birmingham Post, May 31st 2012: The full list of preferred bidders for the police privatisation contracts in the West Midlands and Surrey has recently been published. Cambridgeshire Police look to privatise support staff to plug funding shortfalls, Hunts Post, June 1st 2012: Following in the footsteps of Lincolnshire Police, Cambridgeshire Police are putting plans in motion to privatise back room 'support' staff in their regional police stations. London lawyer takes on G4S' involvement in Israeli security in occupied territories, The Electronic Intifada, June 1st 2012: A London lawyer, and active supporter of Jews for Justice for Palestine, has been interviewed by The Electronic Intifada about G4S Israel's involvement in detention and security in Palestinian territories. G4S whistleblower loses job after claiming overstretched G4S staff were cutting corners when recruiting staff for London's Olympics, The Northerner Echo, June 2nd 2012: A woman from Darlington was told not to return to G4S offices after talking to the media about her fears that G4S' systems were cracking under the pressure of thousand of applications for security jobs during the Olympics. (Subsequently covered in the Daily Mail on the 5th June). - New Corporate Watch update on G4S' interests in occupied territories in Palestine, social housing and international security launched on the 31st May. London Stock Exchange, Paternoster Square, London EC4M 7LS - see the following website for more info.